We are pleased to announce that Alison Brooks Architects’ first major civic and educational commission, Exeter College Cohen Quad, University of Oxford, is nearing completion as the cloisters, cafe and junior common room are now in use. Collegiate quadrangles form the basis of Oxford’s academic and urban fabric, providing learning, study and social spaces for academic communities. The Cohen Quad offers the first fully accessible, purpose designed social learning space in the history of the university. Ahead of the Quad’s full completion later this spring, the students have already started to enjoy the cloisters, cafe and junior common room. 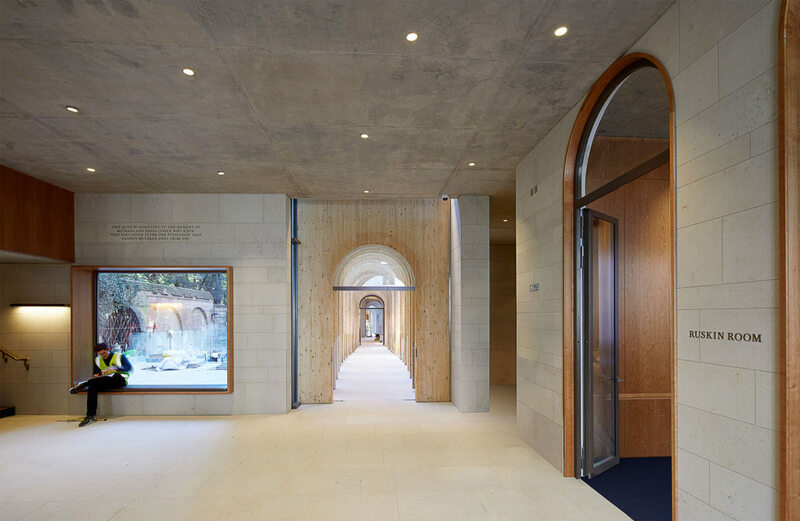 In particular, the ellipsoidal, cross-laminated timber arches of the cloisters are proving to be a popular gathering spot for the college community and fellows. Click here to discover how we are creating a contemporary social heart for Oxford University’s fourth oldest college.